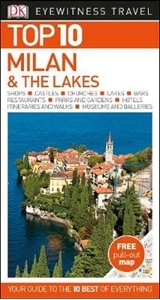 An unbeatable, pocket-sized guide to Milan and the Lakes, packed with insider tips and ideas, colour maps, top 10 lists, and a laminated pull-out map - all designed to help you see the very best of Milan and the Lakes. See Leonardo's Last Supper, head to the rooftop of the Duomo, see the world's best artworks at Pinacoteca di Brera, have an aperitivo in Navigli, or take a day trip to Como or Bergamo. From Top 10 restaurants to Top 10 churches - discover the best of Milan and the Lakes with this easy-to-use travel guide.